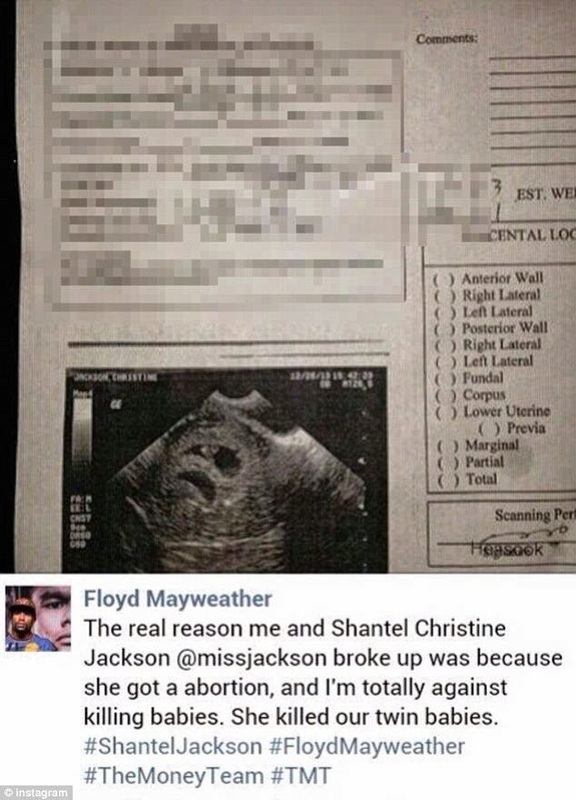 World Champion boxer Floyd Mayweather, has since taken down the photo of his ex Shantel Jackson's alleged sonogram. They split in April after being engaged for 2yrs. She responded by posting an intimate snap with Nelly, her new 'boyfriend'. She never commented on her alleged relationship with Nelly before Thursday but was spotted with him at a Miami Heat game Monday. Mayweather, 37, has 4 children from 2 other exes. World champion boxer Floyd Mayweather has taken down a controversial Facebook post where he shared his ex-fiancée’s alleged sonogram and claimed that he broke up with her because she got an abortion. Mayweather posted the photo of the sonogram to his Facebook and Instagram accounts Wednesday before receiving thousands of negative comments and taking it down. 'The real reason me and Shantel Christine Jackson @missjackson broke up was because she got a abortion (sic), and I'm totally against killing babies. She killed our twin babies. #ShantelJackson, #FloydMayweather, #TheMoneyTeam, #TMT,' he wrote as the caption. TMZ took a grab of the Instagram posting and Jezebel has a screenshot of the Facebook post where the comments of outraged fans are visible. Mayweather and Shantel Jackson dated for four years and got engaged in 2013 when he proposed with a $10million ring. In April, the undefeated boxer who has signed a deal that will net him $200million, he announced that they were calling off their engagement. 'You always want a strong, beautiful woman that you can share your everything with. But I have to go my separate way (sic),' he told MLive at the time. 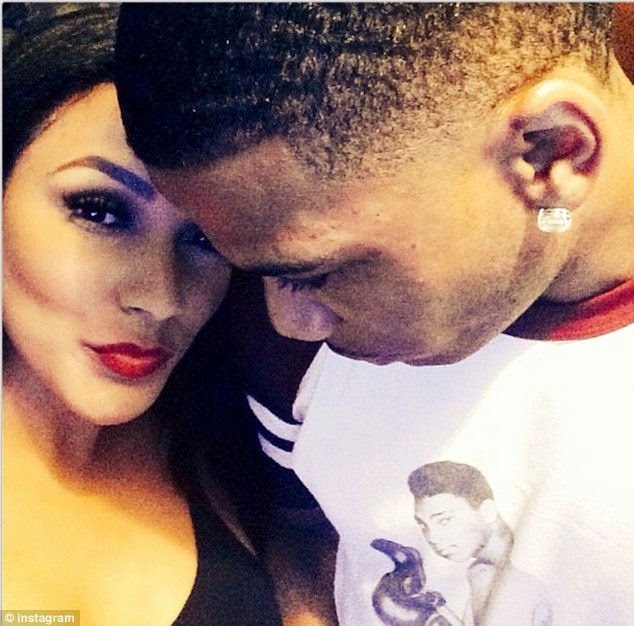 Relations between the two seem to have gotten significantly more tense as Jackson effectively confirmed that she is now dating Nelly, the rapper, by posting an intimate shot of the two of them Thursday morning- just hours after Mayweather shared the sonogram. 'Look up MO say cheese... Lol You encourage me to smile and laugh through all my BS. Thank You. #Realfriend P.S You are truly a comedian. LMAO... !!!' she wrote as a caption to the photo, which has Jackson giving a smirk to the camera while Nelly looks down towards her. 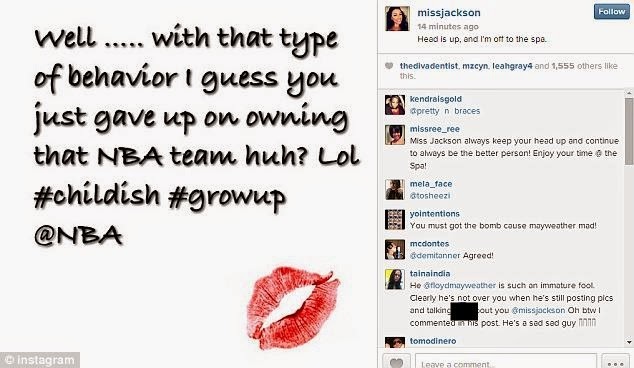 Rumors of a relationship between Jackson and the rapper began when Nelly allegedly posted a photo of the model as his 'Woman Crush Wednesday'. That photo has since been taken down. Hip Hollywood reports that they were then seen together at the Miami Heat basketball game against the Charlotte Bobcats on Monday. 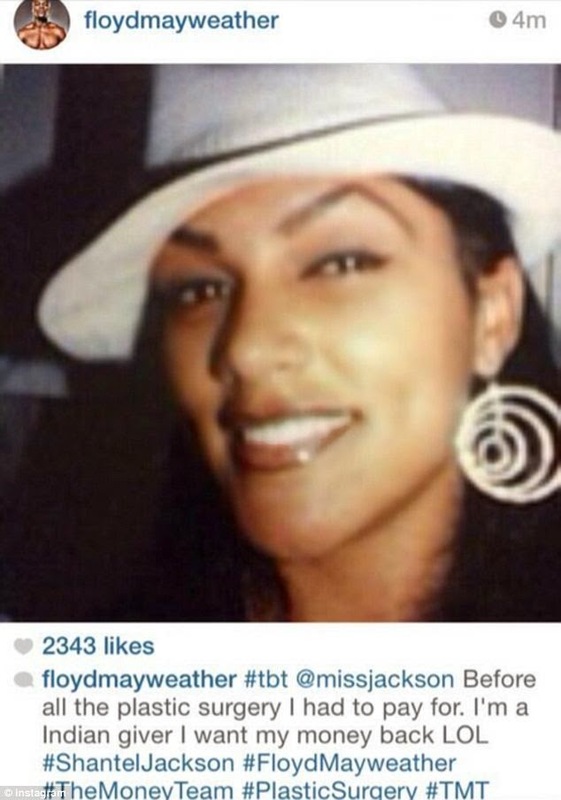 Mayweather couldn't help but throw another (photographic) punch, and three hours after Jackson shared the intimate snap, he posted an old photo of her where he claimed to have paid for undisclosed plastic surgery for his ex- that he now wants back. He has since taken this photo down as well, but Hip Hollywood took a grab of it and reported that the caption read: '#tbt @missjackson Before all the plastic surgery I had to pay for. I’m a Indian giver I want my money back LOL #ShantelJackson #FloydMayweather #TheMoneyTeam #PlasticSurgery #TMT'. Mayweather, who has a history of domestic abuse and was most recently released from jail in August 2012 after being found guilty of assaulting an ex-girlfriend, who is the mother of three of his children. His domestic and social media disturbances are not the only reason he has been in the news this week as he suggested that 'a group of billionaires' join together the buy the LA Clippers in the wake of the Donald Sterling scandal.